It is very possible that in the near future many areas of the country, so-called "dirty power" might be common -- if electricity is available at all. Voltage and cycle fluctuations of over 10% may be expected: voltage as low as 90 VAC or as high as 135 VAC, and cycles below 50 or above 70. "Dirty power" is NOT good for your computer, yet the temptation to be on line, or at least send and receive e-mail, may be overpowering. If dirty power is what you get, it is possible to "moderate" it so that a computer will work. Your computer and monitor can be plugged into an inverter, the inverter connected to a 12 volt DC RV deep cycle battery (or whatever you have), and the battery itself connected to a 10 amp battery charger. The "Rube Goldberg" arrangement described above will work for short periods of time, say an hour, then the battery should be allowed to charge for several hours before being used again, as the draw on the battery can easily exceed the input from the battery charger. The central piece of this puzzle is the inverter. Many homeowners already have a 10 amp 12 volt battery charger and may even have a spare battery (or can "borrow" one from a vehicle). The inverter should be a relatively new unit with a modified sine wave. True sine wave 120 VAC resembles smooth loops. Modified sine wave 120 VAC has "steps," and old style inverters have actual "square" sine waves -- not compatible with computer transformers. But now you must know the current draw of your computer and monitor in order to have an inverter capable of handling the load. A typical desktop computer will have a 240 watt transformer (but some are larger), and many 17 inch color monitors draw 100 watts. Add those two and you have 340 watts of draw. A 350 watt modified sine wave inverter will be maxed out, but can handle the load for an hour at a time, usually. It is much better to have an oversize inverter, say a 500 watt unit, than heat up and destroy the only inverter you have. Check out the wattage draw of your own computer and monitor. It is entirely possible that a $90.00 350 watt inverter will work, such as the "Force 350 Power Inverter" available from Northern. That one is rated at 350 watts continuous duty and 600 watts peak (starting) output, and comes with both alligator clips for attachment to a automotive battery and a cigarette lighter socket plug in (but don't use the lighter plug for heavy draw continuous use -- connect directly to the battery.). Printers are a different story altogether. Although it is difficult to draw generalizations on printer power requirements, many printers can draw 420 watts of power all by themselves. So printing is not recommended....too much battery draw unless you want to get really creative. It is possible to use a 3 hp horizontal shaft gasoline engine to turn a 65 amp alternator, charge two 12 volt RV batteries, hook up a 1000 watt inverter, then be able to run the 'puter, monitor and printer. But that is overkill for the simple purpose of keeping in touch via computer, and a bit expensive. It should be mentioned with a loud CAUTION that batteries under heavy charge and/or use can produce fumes -- sulfuric acid fumes. There aren't enough fumes to get paranoid about, but it would be negligent of me not to mention it. Obviously a draft with opened windows is desirable if the battery is inside the home. Better yet is to have the battery in a plastic marine battery box -- that is why they are available, cheap and distributed so widely. It is possible to have the battery outside the home, but that means the wires to the inverter should be at least 10 gauge and the length kept as short as possible. And of course it is not a clever move to have a battery charger outside in the rain, so it would have to be inside and it's leads going out through a window to the battery. 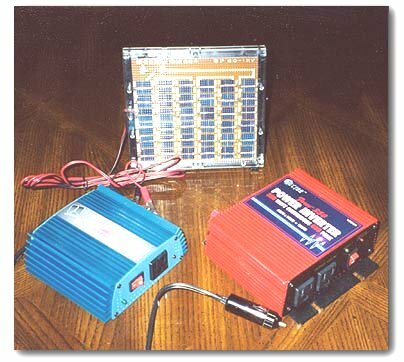 It's a whole lot simpler to have a marine battery box and draw down the battery for only an hour at a time. Remember when you hook up an inverter, battery charger, whatever, to a 12 volt DC battery that the RED WIRE IS POSITIVE, and the black wire is negative. Attach the RED POSITIVE "+" WIRE FIRST, then attach the negative (-) or ground wire last. Maybe it would be simpler just wind up the BayGen, but not nearly as much fun as actually creating a workable power source to clean up "dirty power," get on your computer, and be in contact with your friends. I've done it...been in the chat room with battery power. But there wasn't enough wattage left to run a light bulb, so I was on the Internet, sending and receiving, using a kerosene lamp to see the keyboard. Strange anomaly, that.